I have learned over time as a reader and writer, that all press releases written in the hopes of being noticed and read, follow a pattern. This pattern is the format that all successful press releases conform to. 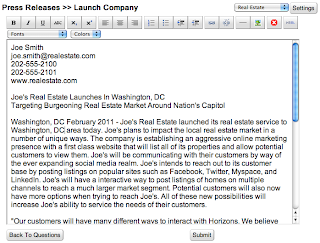 A press release must start out with all the subjects' contact information in the upper left hand corner. This ensures that if you do get your point across, the audience knows where to go for more info or better yet, where to buy your product or service. Next comes the heading, which is probably the most important part of the whole press release. 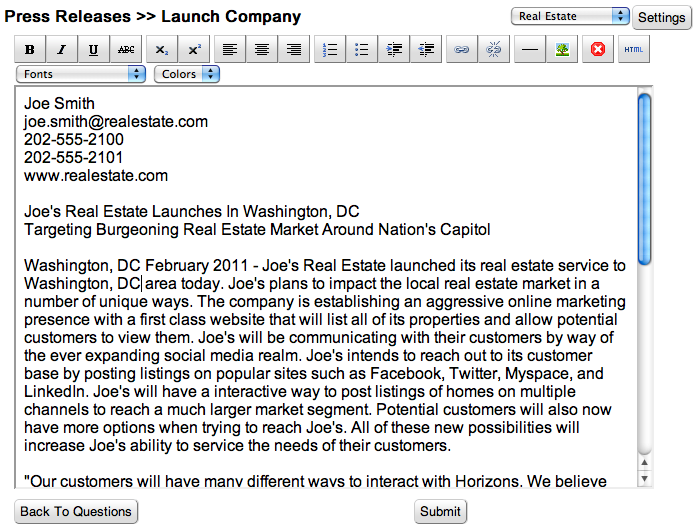 The heading is the key to whether your press release gets noticed or falls by the wayside. It should be as short as possible and compelling to the reader. It needs to grab their attention and hopefully make them want to read more. Almost as important as the heading is the subheading. The subheading can go a long way toward keeping that attention you fought for in the heading. Expounding on your subject, without giving the whole story away, is the goal here. The first paragraph is where the real meat of the press release lives. Even though the distribution mediums for press releases have changed on the web, the press release still needs to be written for the press. This means the first paragraph must contain the 5 W's. Who, What, When, Where, and Why. These questions must be answered in this paragraph if you want anyone to read any further. Some details can be given here that will be expanded upon later. In the second paragraph a quote from someone close to the subject, i.e. company representative, creator, inventor, witness, etc. needs to be presented. This backs up the first paragraph with real testimony. Also, it helps that people close to the subject will speak more passionately about it, advancing your goal of keeping the readers' attention on your subject. Following your quote, in the next paragraph write about all the real details of the subject and expand upon what details you already gave in the first paragraph. This segment should really flesh out the subject and make your story feel and seem complete. To really back up everything you have stated so far, a quote from a customer or witness should come next. Someone who has really experienced what you are writing about. The last thing written is a summary of information about the company, business, individual, and/or service this press release has been about. This is called the "boilerplate" and can be used over and over in related press releases. Last, but not least comes the all important "###" which signifies to serious written and electronic media that you are done, as I am right now.